"The Black Is Never Far"
The idea of metal having soul, as most people think of the term, would strike a lot of people as ludicrous. Those people haven't heard PLACE OF SKULLS, though. Formed by ex-DEATH ROW, CATHEDRAL and PENTAGRAM guitar slinger Victor Griffin, the band is on their third full-length album of doom rock laced with enough pathos and heart-wrenching honesty to make the usual Tolkien-ian avatars of heavy metal look like shallow, rec-room-dwelling dweebs. Don't let the band's professed and unapologetic Christian faith fool you. This is music from a dark place, and as the album title indicates, the road to Hell is never more than a few missteps away. Griffin's vocals deliver husky, blood-tinged melodies fraught with memories of past demons, hopeful for redemption but wary of personal failures and worldly ruin. And those riffs! Anyone into Griffin's past bands, or the discography of fellow icon Scott "Wino" Weinrich (who did time in PLACE OF SKULLS and played on their last album, "With Vision"), will drool like Pavlov's dogs at the thick, massive tone and the double-fisted riffs on display here. Even a textbook midtempo stomper like "Apart From Me" is elevated to classic status by virtue of its heartfelt delivery and weighty low end. And when the band get introspective, as on the acoustic title track or the haunting "Changed Heart", you'll get chills. There's plenty to love if you're not a "true doom" ghoul, too — at their heart, PLACE OF SKULLS is just a damn fine rock and roll band. Their conviction puts their slower stuff over, and they also mix in enough straight-ahead midtempo rockers to keep things interesting. From the melancholy of the beginning of "Lookin' For a Reason", to the raucous and deliberately offensive "Masters of Jest", to the heartstring-tugging chorus of "Changed Heart", "The Black Is Never Far" is a dynamic journey that blows any negative "doom metal" connotations right out of the rat salad! Lyrically, even those not in the same pew as the band should have no problem embracing these universal tales of doubt, confusion and redemption. The band make no secret of their faith — nor do they beat you over the head with it. "Your drugs of contentment / couldn't keep me in peace / I've got an urge to kill / and God I know it's wrong… if I slit a wrist / or connect a fist / would an innocent face survive?" Hardly the stuff of chirpy, up-with-people Christian rock stereotype! One of the triumphs of "The Black Is Never Far" is that Griffin puts his frail, imperfect humanity on display, asking big questions and admitting doubt and weakness, in a way we've been led not to expect from either Christians or metalheads! "The Black Is Never Far" wields mighty riffs and impassioned vocals amid a huge, down-to-business production. It's not as immediate as the band's previous albums, but give it a few listens, start to finish, and let the deceptively simple power of their primal riffs and soulful vocals draw you in. 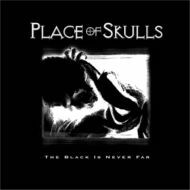 PLACE OF SKULLS deal in timeless heavy rock, genres be damned, and "The Black Is Never Far" is their crowning achievement to date.